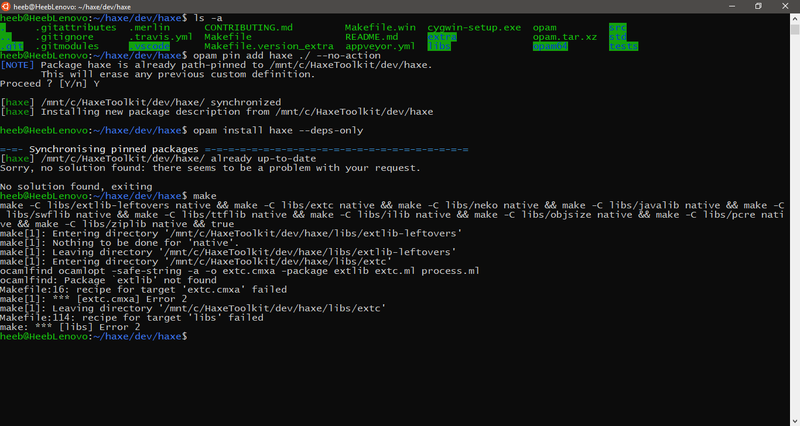 Trying to set up haxe source compilation (yes, still trying), this time on Ubuntu (on Windows Subsystem for Linux). I’ve tried various things, but since I don’t know what I’m doing, I’ve had no success getting past this error message. Did you run opam init? If the command still doesn’t run after that then try the opam switch as mentioned in the error message. Is that opam 2? In that case my recommendation would be to launch it into the sun and install opam 1. How do I go about installing version 1? What Ubuntu version are you using? How did you install opam? Did you spot any error/warning message during opam init? It would be useful if you post the complete opam setup log here. 18.04, Windows Subsystem for Linux. Because of the version 2 vs 1 remark, I later removed opam 2 again, and installed version 1 instead. I’ve gotten somewhat further now. So it;s still not working, but I’ve at least gotten rid of the “switch” problem. Any ideas on how to proceed from here? The funny thing is that you actually have to use opam 2 instead of 1 (due to https://github.com/HaxeFoundation/haxe/pull/8028). What will probably bring back the “switch” problem, won’t it? Need to get 2304 kB of archives. After this operation, 5104 kB disk space will be freed. You may want to back it up before going further. <><> Rerunning init and update ><><><><><><><><><><><><><><><><><>Checking for available remotes: rsync and local, git, mercurial, darcs. Perfect! Update done, please now retry your command. # bwrap: Creating new namespace failed, likely because the kernel does not support user namespaces. bwrap must be installed setuid on such systems. make: Nothing to be done for 'native'. First of all, try to clean up the opam 1 stuff (or any broken opam setup) by removing ~/.opam, which contains the ocaml switches (ocaml compilers and libraries). Just run rm -rf ~/.opam. It will be recreated when doing opam init (don’t run it yet, see below). Secondly, opam 2 on Linux will try to use bubblewrap, which uses some Linux namespacing feature which is not implemented in WSL. So, we have to disable the use of bubblewrap during opam init. Let’s run opam init --disable-sandboxing. Run eval $(opam env) afterward as it is suggested by the opam init output. Thirdly, the errors about conf-* can be solved by installing the related packages. The conf-* packages are opam’s way of stating system dependencies that should be installed outside of opam. So, sudo apt install m4 for conf-m4, sudo apt install neko neko-dev for conf-neko, sudo apt install pkg-config for conf-pkg-config. Done exactly as you said. What’ the output of opam list? BTW, running opam install haxe --deps-only should tell you to run eval $(opam env) again. Do it as it says. Those are only the base OCaml compiler installation. There are no OCaml libraries installed. Did you run opam pin add haxe path/to/haxe --no-action and opam install haxe --deps-only? Any error message when running those? drwxrwxrwx 1 heeb heeb     4096 Apr  2 01:12 .
drwxrwxrwx 1 heeb heeb     4096 Mar 31 21:33 ..
@Matt you are one persistent bada55! Happy to have you here and happy you got things working! Congratulations!